This review was inspired by a friend of mine who said; "you clearly don't like sours that much, you don't review many!" Those who know my drinking patterns would be aware that I'm very partial to sours and so Pat this is for you. 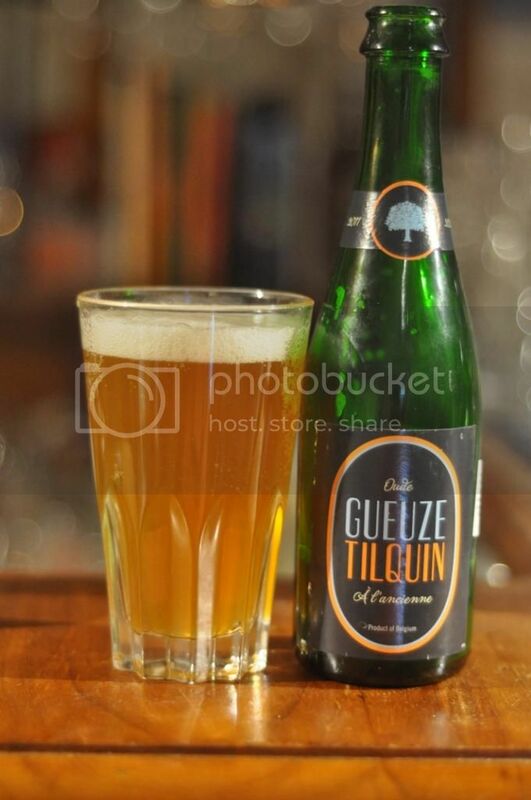 Oude Gueuze Tilquin a L'Ancienne, to give this beer it's full name, is my go to gueuze. In summer I drink this beer regularly. Gueuze Tilquin is a "Gueuzerie" they don't brew their own beer but rather buy wort from other brewers and then age them in various barrels. Fast forward a few years and they blend the different barrels together and create this spectacular gueuze! Gueuze Tilquin pours a hazy golden/straw colour with quite a small white head. Despite the head's small size it has amazing retention, with a good layer of foam covering the beer throughout drinking. There are plenty of carbonation bubbles rising to the head, which must play a significant role in the excellent head retention. It's a lovely looking gueuze. The nose of this one is not as tart as some gueuze's. The Belgian funk is quite prominent as is a green apple aroma. I get hints of other fruits on the nose as well as a grassiness that I would normally associate more with a pilsner. As the beer warms an oaky aroma also becomes noticeable, but it certainly isn't a strong or overpowering woodiness. I could almost write the flavour notes on this beer from memory! It's more complex than the nose with funk and green apple again dominating. It's starts being very tart and then strangely mellows mid-mouth with a sweet citrus quality leading that mellowing charge. Grassiness from the hops is again present but not as strong as the nose indicates. I've never been able to pickup the oakiness in the flavour that appears in the nose, and this was again the case today. Many people ask me "How can you drink that?" in relation to sours. Until maybe a year and a half ago I was one of those people, then suddenly my palate started to appreciate them - and now they are probably my go to styles! My advice to those trying to get into sours is buy 3 of these. Drink one now; drink one in six months; drink one six months after that. If you still don't like it then, you probably never will - this is a seriously good beer but it's not for everyone.